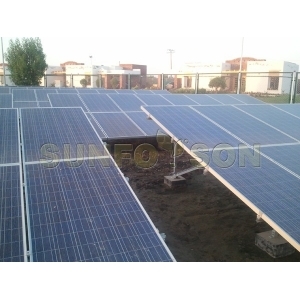 The solar photovoltaic support system is a special support for the placement, installation and fixing of solar panels in solar photovoltaic power generation systems. The bracket system is divided into three types: concrete bracket, steel structure bracket and aluminum alloy bracket. Concrete supports, mainly used in large-scale photovoltaic power plants, because they are self-important, can only be placed in the field, and the base is better, but the stability is high, and can support large-sized panels. 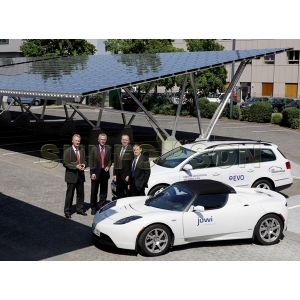 At present, distributed photovoltaics are mainly used for steel structural supports and aluminum alloy supports. The steel structure support has stable performance, mature manufacturing technology, high carrying capacity, easy installation, excellent anti-corrosion performance, beautiful and unique connection design, convenient and quick installation, simple installation tools, and steel and stainless steel parts with structural anti-corrosion materials. In 20 years or more. 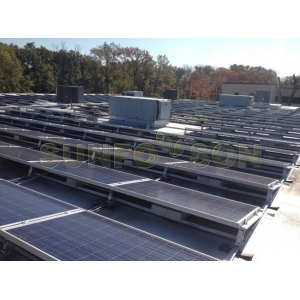 Aluminum alloy brackets are commonly used in residential building roof solar applications. The characteristics of aluminum alloy are corrosion resistance, light weight, beautiful and durable. The disadvantage is that its carrying capacity is low and cannot be applied to solar power projects. The structure is capable of withstanding the various functions and design requirements that may occur during normal construction and normal use, and can maintain the necessary overall stability at the time of occurrence and after occurrence. Good working performance in normal use. For example, there is no excessive deformation that affects normal use. Since the components have a 20-year warranty period, our brackets require the same warranty period. Under normal maintenance, the structure has sufficient durability, such as weathering, aging, and corrosion of materials not exceeding certain limits. First, choose the stent scheme. The lecturer chose to use 10 degree self-weighting bracket system as an example to analyze the performance. Load evaluation and load combination are then performed on the stent scheme. The design load values are finally obtained by combining and designing the following fixed loads, construction loads, wind loads and snow loads. By introducing the design load values and the model into the numerical software for simulation and analysis, the optimization scheme and the reinforcement scheme are finally given.